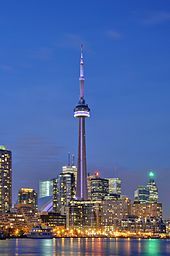 Toronto is the most populous city in Canada and the provincial capital ofOntario. It is located in Southern Ontario on the northwestern shore of Lake Ontario, with the original city area lying between the Don and Humber rivers. According to the 2011 Census, the city had 2,615,060 residents while its census metropolitan area (CMA), which comprises the majority of the Greater Toronto Area, had a population of 5,583,064. The history of Toronto began in the late 18th century when the British Crown purchased its land from the Mississaugas of the New Credit. The settlement established there became York, whichlieutenant governor John Graves Simcoe designated as the capital of Upper Canada. The city was ransacked in the Battle of York during the War of 1812. In 1834, York became a city and renamedto Toronto. It was damaged in two huge fires in 1849 and 1904. Since 1954, the city occasionally expanded its borders through amalgamation with surrounding municipalities, most recently occurring in 1998. This process has left Toronto with clearly defined neighbourhoods that have retained their distinctive nature, earning it the nickname the "City of Neighbourhoods". Toronto is at the heart of the Greater Toronto Area, and of the densely populated region inSouthern Ontario known as the Golden Horseshoe. Its cosmopolitan and international population reflects its role as an important destination for immigrants to Canada. Toronto is one of the world's most diverse cities by percentage of non-native-born residents, with about 49% of the population born outside Canada. As Canada's commercial capital, it is home to the Toronto Stock Exchange and the headquarters of Canada's five largest banks. Leading economic sectors in the city include finance, business services, telecommunications, aerospace, transportation, media, arts, publishing, software production, medical research, education, tourism, and engineering. Toronto is considered analpha world city by the Globalization and World Cities Research Network and is placed among the Global Leaders in the Global Financial Centres Index. The city is also consistently rated as one of the world's most liveable cities by the Economist Intelligence Unit and the Mercer Quality of Living Survey. A simulated-colour image of Toronto taken by the NASA Landsat 7 satellite in 2004. Toronto covers an area of 630 square kilometres (243 sq mi), with a maximum north-south distance of 21 kilometres (13 mi) and a maximum east-west distance of 43 km (27 mi). It has a 46-kilometre (29 mi) long waterfront shoreline, on the northwestern shore of Lake Ontario. The Toronto Islands and Port Landsextend out into the lake, allowing for a somewhat sheltered Toronto Harbour south of the downtown core. 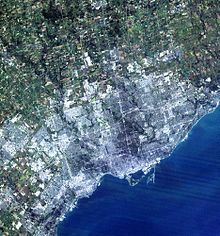 The city's borders are formed by Lake Ontario to the south, Etobicoke Creek and Highway 427 to the west, Steeles Avenue to the north and the Rouge River and the Scarborough-Pickering Townline to the east. The city is intersected by three rivers and numerous tributaries: the Humber River in the west end and the Don River east of downtown at opposite ends of the Toronto Harbour, and the Rouge River at the city's eastern limits. The harbour was naturally created by sediment buildup from lake currents that created the Toronto Islands. The many creeks and rivers cutting from north toward the lake created large tracts of densely forested ravines, and provide ideal sites for parks and recreational trails. However, the ravines also interfere with the city's grid plan, and this results in major thoroughfares such as Finch Avenue, Leslie Street, Lawrence Avenue, and St. Clair Avenue terminating on one side of ravines and continuing on the other side. Other thoroughfares such as the Prince Edward Viaduct are required to span above the ravines. These deep ravines prove useful for draining the city's storm sewer system during heavy rains, but some sections, particularly near the Don River are prone to sudden, heavy floods. During the last ice age, the lower part of Toronto was beneath Glacial Lake Iroquois. Today, a series of escarpments mark the lake's former boundary, known as the Iroquois Shoreline. The escarpments are most prominent from Victoria Park Avenue to the mouth of Highland Creek, where they form the Scarborough Bluffs. Other observable sections include the area near St. Clair Avenue West between Bathurst Street and the Don River, and north of Davenport Road from Caledonia to Spadina Road; the Casa Loma grounds sit above this escarpment. Despite its deep ravines, Toronto is not remarkably hilly, but does increase in elevation steadily away from the lake. Elevation differences range from 75 metres (246 ft) above sea level at the Lake Ontario shore to 209 m (686 ft) ASL near the York University grounds in the city's north end at the intersection of Keele Street and Steeles Avenue. There are occasional hilly areas; in particular, midtown Toronto has a number of rolling hills. Lake Ontario remains occasionally visible from the peaks of these ridges as far north as Eglinton Avenue, 7 to 8 kilometres (4.3 to 5.0 mi) inland. A group of "The Annex" style houses, a style of house that was popular in Toronto in the late nineteenth century. The many residential communities of Toronto express a character distinct from that of the skyscrapers in the commercial core. Victorian and Edwardian-era residential buildings can be found in enclaves such asRosedale, Cabbagetown, The Annex, and Yorkville. Wychwood Park is historically significant for the architecture of its homes, and for being one of Toronto's earliest planned communities. The Wychwood Park neighbourhood was designated as an Ontario Heritage Conservation district in 1985. The Casa Lomaneighbourhood is named after Casa Loma, a storybook castle built in 1911 complete with gardens, turrets, stables, an elevator, secret passages, and a bowling alley. Spadina House is a 19th-century manor that is now a museum. The Royal Ontario Museum (ROM) is a museum of world culture and natural history. The Toronto Zoo, is home to over 5,000 animals representing over 460 distinct species. The Art Gallery of Ontario contains a large collection of Canadian, European, African and contemporary artwork, and also plays host to exhibits from museums and galleries all over the world. The Gardiner Museum of ceramic art is the only museum in Canada entirely devoted to ceramics, and the Museum's collection contains more than 2,900 ceramic works from Asia, the Americas, and Europe. The city also hosts the Ontario Science Centre, the Bata Shoe Museum, and Textile Museum of Canada. Other prominent art galleries and museums include Design Exchange, Museum of Inuit Art, TIFF Bell Lightbox, Museum of Contemporary Canadian Art (MOCCA), Institute for Contemporary Culture, Toronto Sculpture Garden,CBC Museum, Redpath Sugar Museum, University of Toronto Art Centre, Hart House, TD Gallery of Inuit Art and the future Aga Khan Museum. The city also runs its own museums, which includes the Spadina House. City shopping area's include the Yorkville neighbourhood, Queen West, Harbourfront, the Entertainment District, the Financial District, and the St. Lawrence Market neighbourhood. The Eaton Centre is Toronto's most popular tourist attraction with over 52 million visitors annually. The many residential communities of Toronto express a character distinct from that of the skyscrapers in the commercial core. Victorian and Edwardian-era residential buildings can be found in enclaves such as Rosedale, Cabbagetown, The Annex, and Yorkville. Wychwood Park is historically significant for the architecture of its homes, and for being one of Toronto's earliest planned communities. The Wychwood Park neighbourhood was designated as an Ontario Heritage Conservation district in 1985. The Casa Lomaneighbourhood is named after Casa Loma, a storybook castle built in 1911 complete with gardens, turrets, stables, an elevator, secret passages, and a bowling alley. Spadina House is a 19th-century manor that is now a museum. The Old City of Toronto covers the area generally known as downtown, but also older neighbourhoods to the east, west, and north of downtown. It includes the historic core of Toronto and remains the most densely populated part of the city. The Financial Districtcontains the First Canadian Place, Toronto-Dominion Centre, Scotia Plaza, Royal Bank Plaza,Commerce Court and Brookfield Place. This area includes, among others, the neighbourhoods of St. James Town, Garden District, St. Lawrence, Corktown, and Church and Wellesley. From that point, the Toronto skyline extends northward along Yonge Street. Old Toronto is also home to many historically wealthy residential enclaves, such as Yorkville,Rosedale, The Annex, Forest Hill, Lawrence Park, Lytton Park, Deer Park, Moore Park, andCasa Loma, most stretching away from downtown to the north. East and west of Downtown, neighbourhoods such as Kensington Market, Chinatown, Leslieville, Cabbagetown andRiverdale are home to bustling commercial and cultural areas as well as communities of artists with studio lofts, with many middle and upper class professionals. Other neighbourhoods in the central city retain an ethnic identity, including two smaller Chinatowns, the Greektown area,Little Italy, Portugal Village, and Little India, along with others.